After my second disc surgery on my neck in 2 years, the doctor told me I had degenerative disc disease. Five years ago a disc in my lower back slipped out of place. If you have experienced this, you know how limiting this pain can be on your day to day activities. It was shortly after that incident when I realized the need to be more proactive in treating my back to stay out of the operating room. Since then, I am happy to say I have been able to stay active doing everything I want to do – horseback riding, yoga, P90X, Insanity, weight lifting, running, and many other activities. My back pain flare-ups went from happening every few months to currently, it has been over a year since my last incident. Make sure to see your medical professional to get advice on your individual assessment prior to implementing these steps. Many of my friends suggested I see a chiropractor. An area of the medical field I had never held in very high regard but during the time, I was willing to do almost anything to avoid a very invasive surgery coupled with a long healing process. After a few visits, my feelings towards the profession softened as my back pain was beginning to diminish. This chiropractor was great at explaining the science behind what he was doing as well as the active role for me to continue the strengthening long after my appointments ended. Once my acute back pain had disappeared, we worked on the strengthening segment. He explained what our REAL CORE MUSCLES consisted of. Not the muscles we commonly refer to as our abs, but the very tiny muscles that attach one vertebrae to the other. The core muscles he referred to are those that keep our vertebrae in alignment. There are some very specific exercises we can do to strengthen them and thus, help reduce future back pain. As the video shows, the fitness ball allows you to work the very small but important muscles of your lower back that tend to begin to weaken once we get into our 40s. Strengthening our lower back as well as our abs and complete core, will help in additional ways such as posture, walking long distances and even normal day to day activities around the house or at work. The next thing I learned was to be aware of my limitations. As much as we hate to hear it, there are a few limitations to what our bodies can handle after 40. How many times have we heard, lift with your legs? If you haven’t taken this to heart before, now that we are over 40, it is certainly time to lift with our legs every single time. Not sure exactly how to lift with your legs? Watch this short video from Doctor Jo as she demonstrates lifting with your legs perfectly! 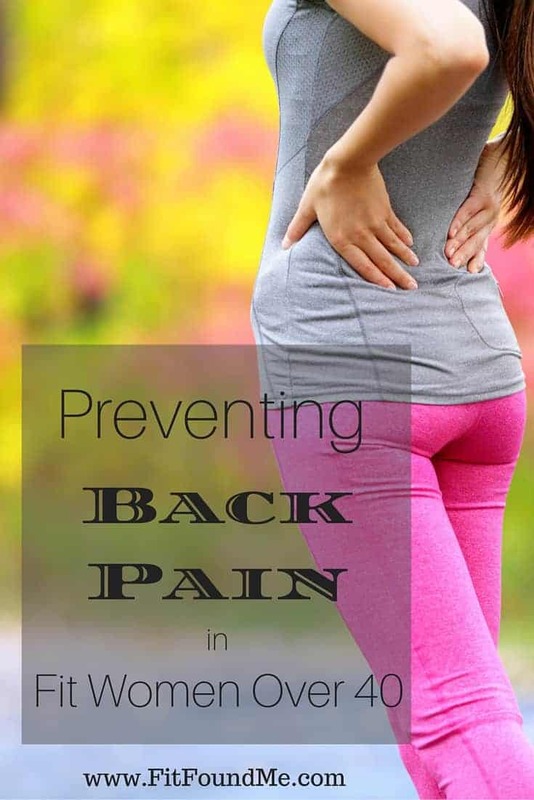 Due to the source of my back pain being in the lumbar (lower part) of my back, repetitious bending at my waist should be avoided whenever possible. When workouts include burpees and other exercises with similar bending movements requires a modification or elimination all together. There are other exercises that can be performed that will yield the same outcome as the original movement. Often times, the instructor will have a person performing a modified version or at the very least, demonstrate the modification him/herself. The good news is, as long as you are mindful of your exercises and movements, women over 40 can be fit while sustaining a pain free back.